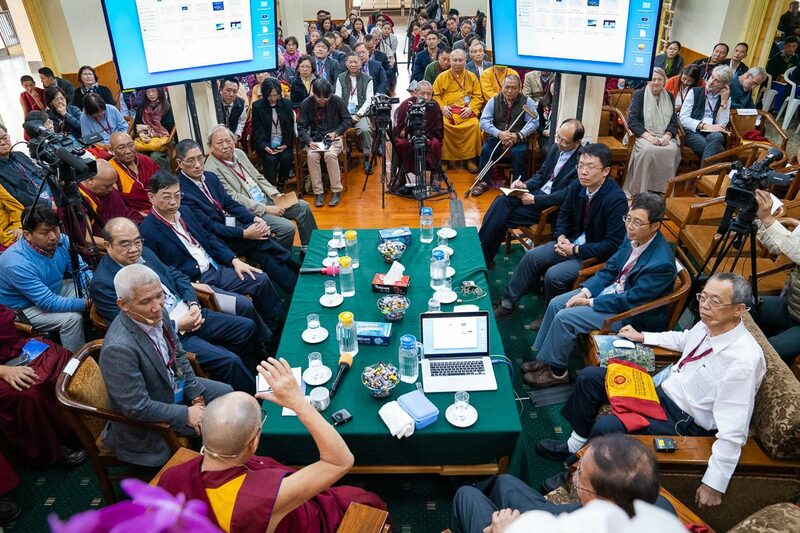 (TibetanReview.net, Nov03, 2018) – Tibet’s exiled spiritual leader, the Dalai Lama, on Nov 1 began a three-day dialogue with ethnic Chinese scientists at his Thekchen Choling residence in Dharamshala. The nine visitors were stated to be mostly Physicists from Taiwan, including Nobel Laureate Professor Yuan Tseh Lee. There was obviously none from mainland China. The theme of the discussion, organized by the Dalai Lama Trust, is ‘Dialogue between His Holiness the Dalai Lama and Chinese Scientists on Quantum Effect’. The other members of the panel were stated to be Dr Shih Chang See, physicist; Dr Chii Dong Chen, Research fellow at the Institute of Physics, Academia Sinica, Taiwan; Dr Yueh-Nan Chen, distinguished professor at the Department of Physics, National Cheng-Kung University; Dr Shawn Y Lin, Chair Professor at Future-Chips Constellation and Physics Department, Rensselaer Polytechnic Institute in Troy, New York; Dr Ting-Kuo Lee, Physicist; Professor Maw-Kuen Wu, Research fellow at the Institute of Physics, Academia Sinica, Taiwan; Professor Albert M. Chang, Duke University; and Professor Chung-Yuan Mou, Chemistry Department of National Taiwan University. The Dalai Lama has spoken of having pursued dialogues with the scientific community, particularly western scientists, for more than 30 years, noting that Buddhism had much in common with modern science in the fields of cosmology, neurobiology, physics, and psychology. He has explained his second purpose to be to draw attention to the importance of warm-heartedness and compassion and to discuss how to educate people in these values from a secular point of view. “Just as we observe physical hygiene to stay well, we need to cultivate a kind of emotional hygiene too,” he has said. He has called for a scientific approach to the promotion of warm-heartedness. Around 50 Chinese scientists, scholars, researchers, professors and observers are stated to be attending the dialogue, along with some 270 Tibetans, mostly students. The first day’s sessions were stated to include a presentation by Dr Shih Chang Lee which focused on Space-time symmetry and Quantum Physics, followed by a presentation on Quantum mechanics, the theory of entanglement by Dr Chii Dong Chen. There were also presentations on Quantum biology and Modern Photonic Revolution – the sun, the light and the photonics chip by Dr Yueh-Nan Chen and Dr Shawn Y Lin.